Special Focus on: Gastro-Intestinal Disorders (IBS, Reflux, Crohn’s, Constipation, Gluten issues, etc),Thyroid & Adrenal Imbalance, Chronic Fatigue/Fibromyalgia, Auto-Immune Diseases, Chronic Skin Conditions, Metabolic and Blood Sugar Issues, and Insomnia. My focus is on uncovering the root cause of any condition. My goal is to not only help you resolve your symptoms, but to also (and perhaps more importantly) help you understand how and why those symptoms or that condition came about in the first place. I practice what is called Functional Medicine. This is a style of medicine where the latest in diagnostic testing is combined with the most current research in how those results fit together to give us a much more complete understanding of your biochemistry, hormone imbalances, immune system function, gut function, and metabolism than was previously possible. It is through this understanding that we can more correctly identify the cause and more effectively treat it. To achieve this, I use nutritional supplements, nutrition and dietary advice, Acupuncture, Chinese and Western herbal formulas, physical manipulation, homeopathy, and other natural modalities. I can also prescribe certain drugs, but these are used only when absolutely necessary. One of my mentors used to always say, “If you do what you’ve always done, you will get what you’ve always gotten.” I encourage my patients to be open to change within their diets and lifestyles and to be open to new ideas regarding their conditions and how to approach them. I focus on educating my patients in preventive measures and I try to empower them to take charge of their wellness. Every treatment program I recommend is completely tailored to each individual I see. 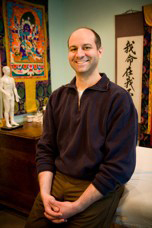 Some want to see me as a Naturopath, others as an Acupuncturist, and with many patients I combine the two. Whatever we do, my goal is to help you achieve your optimal level of health. I work with everyone from infants to the elderly. If you can not find answers to your questions on my site, please do not hesitate to contact me.